While Tom Cruise has been a staple in the action genre for years, the aging star recently seemed to be slowing down his involvement in high intensity physical roles. However, if last year’s hit “Mission Impossible: Ghost Protocol” proved anything, it’s that the 50-year-old actor still has the stamina and star appeal to handle an action franchise. 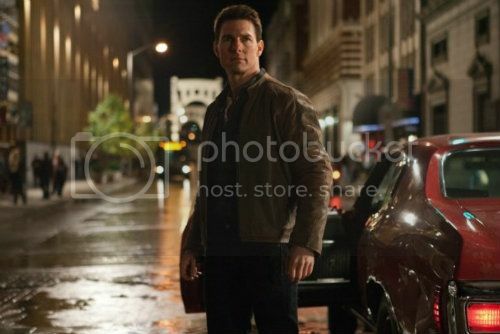 Now, Cruise is back, headlining director Christopher McQuarrie’s “Jack Reacher,” the first film adaptation of Lee Child’s popular book series, based on “One Shot,” the ninth of seventeen novels in the series thus far. With a wide and dedicated fan base for the series, there was some uncertainty when Tom Cruise was announced as the title character — Jack Reacher is 6-foot-5 and is a muscular 210-250 pounds — and many were afraid Cruise wouldn’t be able to do the character justice. Now, time and the box office will tell if Paramount Pictures made a wise decision in choosing Cruise and also whether the book series will transform into a full-fledged film franchise. A man on top of a parking structure uses a sniper rifle and kills five innocent and seemingly unrelated people on the public steps of a Pittsburgh public building. Evidence at the crime scene leads the authorities to James Barr (Joseph Sikora), an ex-army infantry trained sniper and the perfect fit to the crime, but when questioned all he says is “Get Jack Reacher for me.” Reacher is an ex-military police officer who has since become a drifter, moving around a lot and staying off the grid — he doesn’t have a bank account, a car or anything he can’t carry. When he sees the news about the shootings, he makes his way to Pittsburgh and ultimately decides to run his own investigation of the situation. He starts by working with Barr’s attorney, Helen Rodin (Rosamund Pike), and lets the investigating detective, Emerson (David Oyelowo), know he has history in service with James Barr. District Attorney Alex Rodin (Richard Jenkins), who also happens to be Helen’s hard-nosed father, thinks it’s an open and shut case. But the more Jack Reacher looks into the details surrounding the case, the more he begins to believe that the man who is about to go down for the crime wasn’t the one who committed it. Looking for truth and justice, his sharp wits and deduction skills will take him on a journey to uncover the truth. Could there possibly be a conspiracy to a much larger plan and a criminal organization behind it all? My first thought when I saw the trailer for “Jack Reacher” was that it is a typical Tom Cruise action film, but I was surprised to learn that the movie is fast paced, filled with action and comedy and is a very entertaining detective story at its core. One of the main reasons it doesn’t feel generic is due to the fact that the movie and also Tom Cruise don’t take themselves too seriously, they allow themselves to have fun and enjoy the ride. While Jack Reacher doesn’t speak much, he is filled with questions and you can see the intensity when he is thinking and evaluating everything around him. Cruise, who is a veteran at these sorts of films by now, still impresses with his hand-to-hand combat skills and the movie is filmed in a way you can tell he does the majority of his own stunts, which lends to the credibility of the overall film. The fight scenes are very animalistic and primal in nature and seem believable. The rest of the cast does a good job as well, and even some of the smaller roles seem to come full circle in the end. Robert Duvall plays a gun range owner who ends up helping Cruise in his investigation. And although the film’s main villain, “The Zec,” is only in a few scenes, he steals every one with many quotable lines and his main henchman, Charlie (Jai Courtney), is a force to be reckoned with. He eventually has a riveting free-for-all against Jack Reacher where only one will survive. Rosamund Pike is an interesting choice for the female lead and has the most screen time with Tom Cruise. Her passion shines through in her performance and vulnerability, and she brings life to a character that could have easily been forgotten. The rest of the cast is filled with talented actors who help bring emotion and drama to this story, but it is, after all, a movie all about Jack Reacher and Tom Cruise is clearly the star of the show. While Tom Cruise is clearly not the staggering beast of a man described in the books, he makes the role his own and does justice to the mental and physicality in his portrayal of this very strong, stern character. Although there is a decent score, the lack of music during most of the film’s fast-paced moments brings a brutality to the action and fighting. As a whole, “Jack Reacher” is a fun time at the movies and filled with intensity. It is another staple in the Tom Cruise action hero genre of films and if he chooses to continue on with future films involving this character, Cruise has once again successfully started a new film franchise. “Jack Reacher” opens in theaters tomorrow and is rated PG-13 for violence, language and some drug material.